Ana Vargas took part in Year Up in Boston. The program helps many from low-income backgrounds earn college credit while gaining skills. 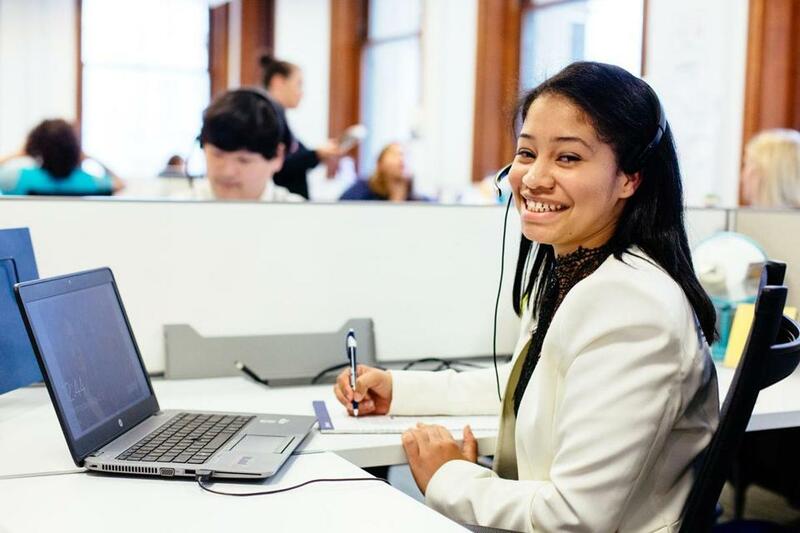 When Gerald Chertavian started Year Up in 2000, the nonprofit set out to help 22 young adults from low-income Boston neighborhoods earn a decent wage. The organization has come a long way from that modest beginning. A new study has found that 4,100 Year Up participants from 21 cities across the country are benefiting from the largest earnings gain associated with any workforce program in US history. The research was part of the Pathways for Advancing Careers and Education project sponsored by the US Department of Health and Human Services’ Administration for Children and Families. It reported that Year Up group members earn 53 percent more than economically disadvantaged young adults who did not participate in the program. The findings said Year Up increased total hours worked by three to four per week and graduates earned nearly $4 more per hour than members of a control group that were part of the study. Under Year Up, young adults from low-income backgrounds — ranging in age from 18 to 24 — with a GED or high school diploma can earn college credit while gaining skills in areas such as information technology, quality assurance, and testing applications to assess functionality. Upon completing the yearlong program, graduates earn on average $17.41 an hour, which amounts to $34,000 per year and triumphs over the state’s $11 minimum wage. Researchers analyzed Year Up alongside eight other workplace development programs. The $3 billion in annual funding for the program — through the 1982 federal Job Training Partnership Act — was reduced by 90 percent by 1995 because, Chertavian said, critics claimed the programs failed to demonstrate that they made a difference. Chertavian, Year Up’s chief executive, said he hopes the study serves as evidence that investing in job training can increase socioeconomic mobility in lower-income communities. It “absolutely shows that we can enable people to lift themselves out of a situation of poverty and into a good job, and therefore should be investing in people and seeing them as assets instead of social liabilities,” he said. Year Up students spend six months learning an array of skills such as time management, networking, and leadership. The next six months are devoted to an internship with one of Year Up’s corporate partners, which include 40 Boston-based companies every year. The money that affiliated corporations pay to get interns covers 59 percent of the program’s operating costs, according to Year Up. Combined with sponsorships and private donations, that leaves only 2 percent of the national program’s $150 million budget to public funding. The internships often lead to full-time jobs. Since 2000, for example, Bank of America Corp. has hired 690 Year Up interns, while State Street Corporation has hired 700, according to Chertavian. State Street reports that it converts 60 percent of Year Up interns into full-time employees. “Year Up has opened a new talent pipeline for us that we’ve been able to take advantage of with terrific results,” said Mike Scannell, senior vice president and president of the financial firm’s philanthropic arm the State Street Foundation . Andrea Lozada, one of State Street’s Year Up hires, didn’t have many employment options when her family moved to Lexington from Mexico in 2014. She graduated from the program in 2015 and recently received her second promotion, to investment manager service team leader.